You've got to have the right tools to do the job right, and for power shakin',Yum Pumpkin Ed is the right tool. Power shakin' takes shaky head fishing to the next level, and the Pumpkin 'Ed jig is the foundation of that technique. The extended lure-holder spring makes rigging easy, and the flat head and horizontal line tie prompts the jig to stand straight up on bottom. 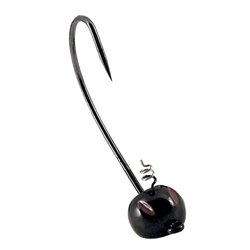 Rigged with a worm or minnow-shaped plastic it mimics a fish or other invader feeding on bottom; rigged with a soft plastic craw it stands up in a defensive position. B.A.S.S. Elite pro Edwin Evers won the 2011 Citrus Slam on a prototype of this jig!